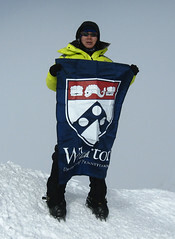 Lei Wang, WG’03, flying the Wharton banner atop Antarctica’s Vinson Massif. Just yesterday, after one last round of proofreading, we here at Wharton Magazine sent our spring issue off to the printer. Which means you should be receiving your copy sometime in mid-April. And I must say: You’ve got something to look forward to. This is the fourth issue we’ve published since I arrived here as Editor just over a year ago, and I think it’s our best effort yet. The stories are interesting, thought-provoking and a little off-beat. The design and photography are outstanding. And the Final Exam challenge is about cheesesteaks. How can you beat that? In other words, yes, I’m really proud of this issue. Here are a few of the reasons why. In our guest commentary, Scott Shane, G’91, GrW’92, tackles a difficult and politically tricky subject: The role genetics play in our career successes (and failures). Shane, a professor of economics at Case Western Reserve University’s Weatherhead School of Management, writes that “even if you don’t like the idea of genetic influences on job-related behavior, you can’t make these effects go away by ignoring them.” His insightful piece is excerpted from his forthcoming book, Born Entrepreneurs, Born Leaders: How Genes Affect Your Work Life. In our Debrief section opener, we chat with with Lei Wang, WG’03, who at this very moment is in transit from her Massachusetts home to Nepal (and looking for her luggage somewhere in London, according to her most recent tweets), where she’ll later this spring attempt to climb mighty Mt. Everest. If she succeeds, she’ll become just the second woman in history to climb the tallest mountains on each of the seven continents and ski to both the North and South Poles. In our story, Wang talks about why she decided to pursue this dream—and why she was willing to sacrifice so much in order to achieve it. Those are merely a few of the highlights. But I assure you, there are much more, and so I hope you enjoy reading this issue as much as we enjoyed putting it together. As always, we invite you to share your opinions with us by sending your letters to letters@whartonmagazine.com. You can also follow us on Twitter @whartonmagazine.